Friends…I’m baking brown rice these days. For years, I’d made it on the stovetop, as that’s how I learned how to cook rice when I lived in the Dominican Republic years ago. Then I discovered the rice cooker. I’ve only been using my rice cooker for a few months, but I love it. It cooks the rice so beautifully, and the clean up is way simpler than cleaning (and sometimes scrubbing out) the saucepan. But I loaned my rice cooker to my sister. And I didn’t want to go back to the stovetop. (Not that I won’t ever cook rice on the stovetop again!) But…even if I set the timer, I might not get there in time… for it to be perfectly cooked. These early days with a baby make it difficult to commit to being at any one time…even if the timer is set and the rice should be cooked perfectly. We could be in the middle of a fuss-fest, and diaper change and outfit change, or in the middle of a nursing session. 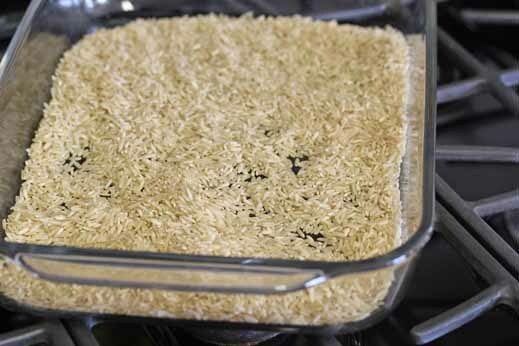 Cooking brown rice on the stovetop is a fine art, and requires a bit of attention towards the end, to make sure you get that perfectly cooked and fluffed brown rice to serve for dinner. So I’ve turned to the oven. Baking brown rice. There are a number of “rice bake” recipes in my One Dish Dinners cookbook. 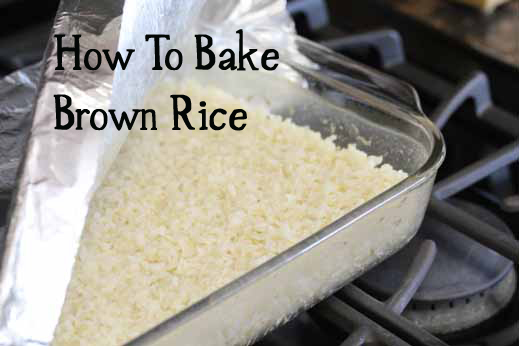 But today, I thought I’d share a basic how to cook brown rice. Feel free to experiment with mixing in different spices and veggies. 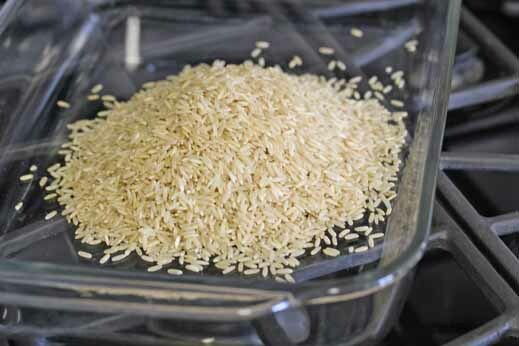 Add 1 1/2 cups raw brown rice to bottom of a 9×13 inch glass baking dish. Spread evenly over the bottom of the pan. 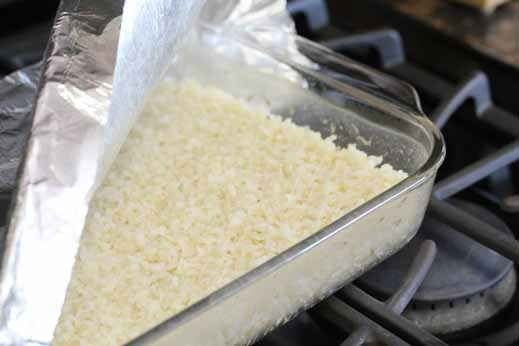 Pour in liquid at ratio of 2 1/4 times the amount of rice you used. I generally do water, but if I want it a bit more flavored, I will do half water and half chicken or vegetable broth. 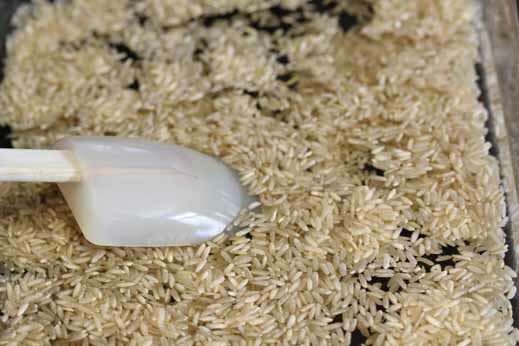 Press down any floating rice with a flat spatula. Let cool slightly before removing the foil…there will be lots of steam and you don’t want to get a steam burn! Fluff with a fork, season with salt and pepper and serve. And that’s how you do it friends! Simple, deliciously perfect brown rice, baked in the oven! Preheat oven to 350 F. Lightly grease a 9×13-inch baking dish with non-stick cooking spray. Sprinkle the brown rice into the dish and spread flat. 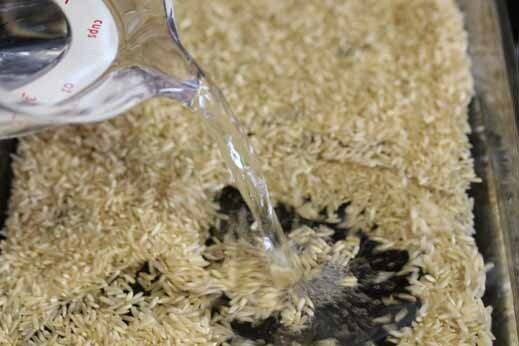 Pour in the liquid and make sure all of the rice is ‘underwater.’ Press any floating pieces into the water. 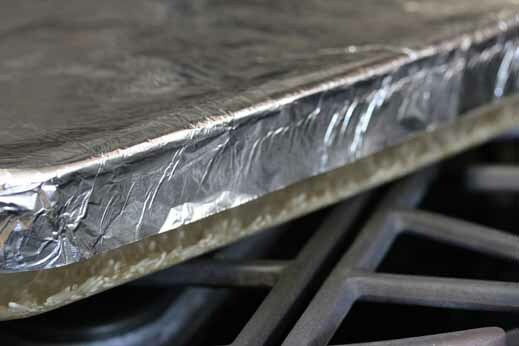 Wrap tightly with foil and bake in the preheated oven for an hour. Carefully remove the foil (hot steam will escape!) and then fluff with a fork before serving. Season with salt and pepper, add a pad of butter or mix in a little sauce of some kind to give it your favorite flavor. 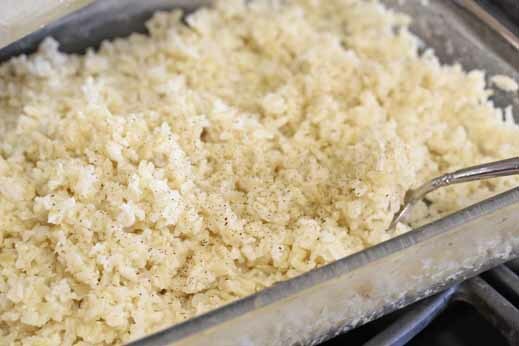 Serve Baked Brown Rice as an easy side dish. 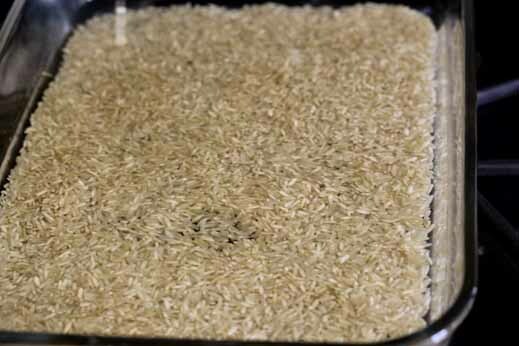 *NOTE: if you want to cook less rice, then cook 1 cup brown rice with 2 1/4 cups of water in an 8×8-inch baking dish. Can I add some salsa and bite size chicken breast cubes to it and make it a one dish meal? I just do not know how much of each to use! Can u help me figure it out. I did a baked white rice and chicken recipe one week ago and the rice was so under-cooked i had to throw it away! We mostly ate the chicken. That is why i ask you, an expert! I want to use only brown rice… but i want to be sure i get it right tonight! I’d recommend cooking the chicken with the rice (2-3 chicken breasts, cut into cubes) and then adding the salsa after that has cooked. I like brown rice, but if I want my family to like it too, I make it with chicken broth and a little butter. I will definitely try baking it. I have been making a whole bag lately, because you can freeze it when it is cooked! Seriously, that discovery has totally changed how often we use brown rice around here. If I want it as a side dish, I make it, the texture is not as good after it is frozen, but the frozen/thawed is great for mixing in soup, burritos, casseroles, all kinds of stuff. Saves me a ton of time! if you slightly undercook it before freezing, and then add a little water and cook in the micro for 5 minutes, it’s pretty perfect! Make sure you take component in a contest for one of the top blogs on the internet. I will suggest this site! This is the best baked brown rice recipe that I have tried, Thanks! I’d like to make this into a baked brown Mexican rice. Any ideas about what to add to serve with a Mexican main dish? Hi Melissa. Try adding some corn, red or green bell peppers, and cumin. Great Tex-Mex flavors. i like this rice cooker very much, it seems so nice. I’m new to this site and it’s awesome so far. This is a great idea. It would also be nice to free up some of the stovetop when your cooking multiple things. I have been baking my rice for years. I usually add petite peas, shredded carrot, sliced scallions, broccoli and water chestnuts to my rice. I throw it in for the last 5 minutes of the bake. The brown rice in the photos looks like long grain. I have short grain. Do the directions apply to all kinds of brown rice? Sure seems a more fool proof way to cook the rice, thanks.